The Honorable J. Randy Forbes. 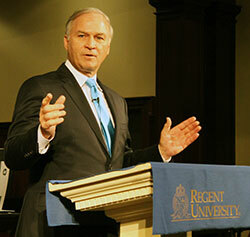 On Wednesday, September 19, the Honorable J. Randy Forbes, a Regent University fellow and former Virginia and United States congressman, spoke to a group of students and faculty at the annual A. Willis Robertson lecture. The A. Willis Robertson lecture, hosted by the Robertson School of Government, is a celebration of the legacy of servant leadership and integrity found in Senator Absalom Willis Robertson, the father of Regent’s founder, chancellor and CEO, Dr. M.G. “Pat” Robertson. Senator Absalom Willis Robertson had a distinguished career marked by leadership and sacrifice. He served in the U.S. Army before going on to represent his fellow Virginians for forty years in the Senate of Virginia, the U.S. House of Representatives, and the U.S. Senate. In January 2017, Forbes became a Regent University fellow — a timely addition to the university’s leadership. With the launch of Regent’s Cybersecurity Institute, Forbes will develop a defense industry summit. “Adding Congressman Forbes to Regent’s faculty roster aligns well with our university’s strategic goals,” said Dr. Gerson Moreno-Riaño, Regent’s executive vice president for academic affairs. Besides his work as a fellow at Regent, Forbes is also a fellow at the U.S. Naval War College. In his lecture, “The Future of Public Service in Virginia Politics,” Forbes discussed his own experience in Virginia politics and how people can maintain their beliefs while remaining civil and finding common ground — something he said is becoming increasingly less common. He believes if Americans fail to maintain civility within political institutions, the consequences are dire. “The biggest threat to freedom is hatred, because if you have hatred our institutions can’t function,” he added.